Support for bringing your lunch to work and forgoing the instant pizza delivery just got stronger. Not only is creating home-cooked food healthier and less expensive, researchers just stated that it can increase your well-being. A research team examined for the first time how product self-creation affects our consumption experience and well-being. Seven studies showed evidence that when consumers self-create a product, they appreciate it to a greater degree, are likely to consume it more mindfully, and experience greater overall well-being. Making our meals can help us consume more consciously while enhancing the enjoyment of our consumption. The research included a cooking school study looking at people who took a series of cooking classes and then cooked at home. Another study investigated participants who received Hello Fresh meal-kits to create meals at home. 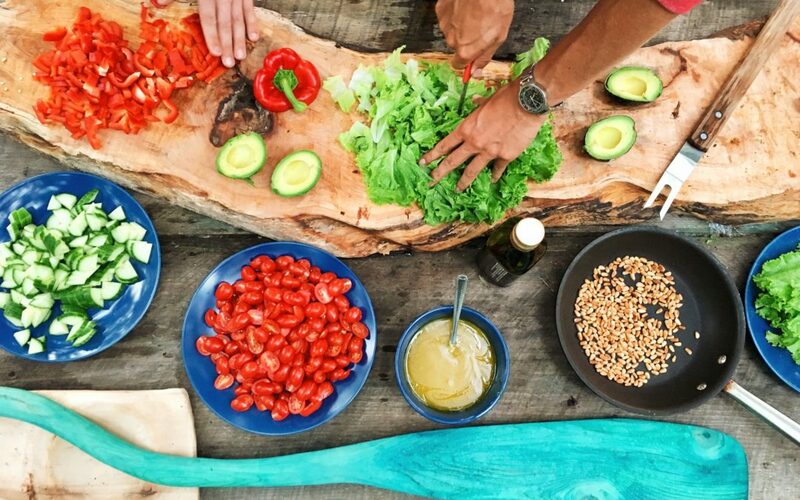 The cooking school study revealed that taking the cooking classes and learning to cook is associated with eating mindfully and positive health well-being. In the meal-kit study, after ordering meal kits and cooking at home, consumers showed more mindful food consumption and greater well-being. Read their paper here: The Self-Creation Effect: Making a Product Supports Its Mindful Consumption And the Consumer’s Well-Being. So choose your veggies, grab a mandoline and slice your way to an improved state of mind!